A sweet couple in our church went to Tennessee last week and came home with a huge box full of these peppers!! 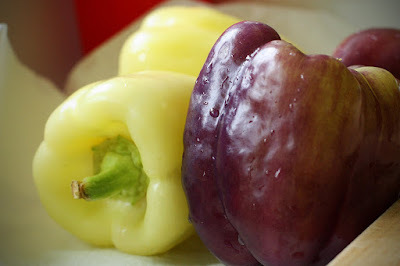 I've never seen pale yellow or purple bell peppers before!! Have you? Oh!!! I hadn't thought of seed catalogs!! Thank you, Mrs. Mordecai!! Not here. This year was our 2nd year gardening and my jalapenos came out tasting like bell peppers though....my only guess is that I had them in the next row of my banana peppers..is that what happened??? So sad... blogs are disappearing!! !